CSA! - Crochet, Starbucks and roadtrips, oh my! I thought my scheduled day to pick up my veggies was Thursday, so it's a good thing I re-checked the email I got from Gathering Together Farm this evening - my scheduled day was today! 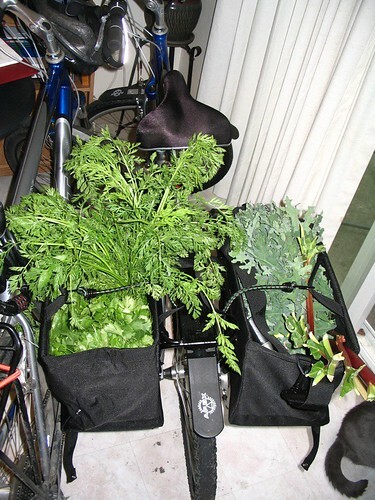 So I hopped on my bike and pedaled down to a truck parked in front of a house near Fred Meyer, signed in, and filled my panniers with veggies. It just barely fit in my panniers! I was worried I was going to bounce some of it out on my way home. When I got home I unloaded - it filled up the whole stovetop. Contents: Rhubarb, romaine lettuce, spinach, red kale, carrots, Walla Walla onions, spinach, pea tops, cucumber and cilantro. I ate some braised kale and pea tops with some leftover onion, and some mashed potatoes. I am now very full and I'm happy that I had a healthy dinner. 'Cept I don't like cilantro. I will take it to work in the morning. Looks yummy! I've been wanting to go to a farmers market around here on the weekend but haven't made it yet. I brought it to work and one of my coworkers took the bunch from me and ate half of it as we were chatting. I had to back up 'cause he had major cilantro breath. :D That stuff is strong! I don't think I could eat a raw bunch like that. I love it in salsa or thai food! 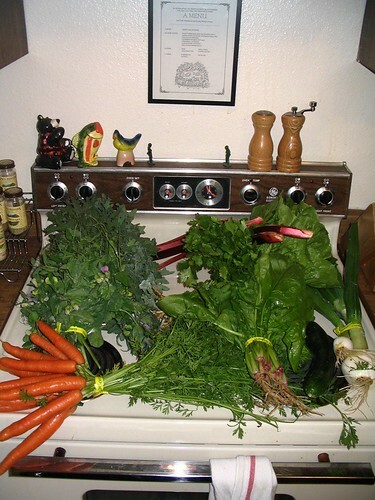 I have a feeling that I'm not going to know what to do once Halloween rolls around and the CSA is done for the year! What am I going to eat?! Today is my first pick up for our CSA as well! I am excited but wish it was not as far a drive as it is. I want to suggest that they start a yahoo group so the collective we of the CSA can talk and create ride shares or shared pick ups. I hope they think it's a good idea as well! Looks yummy and i am very excited to see what mine all looks like!! That's too bad that you have a long drive. If I wanted to pick it up from the farm itself it'd be about ten miles, but the pickup spot I chose is 2 miles from my house. They even truck it over to the beach, which is an hour away - that's good service! Do you have to go to the farm for yours? Yes I do, they are new small farm that is only been doing this for three years. I had little choices but what I appreciated the most about this one, was that I chose each week what is in my box! I have very picky eaters in my home and so it's important to me to reduce waste/compost. I live in the Kitsap area of Washington state and it has some growing to do before it is as progressive as many of the CSA's or farmer's markets are in the Seattle area. Oh, it's nice to be able to choose! I kind of like not having that option (though it's just two of us and neither of us are super picky) because it forces me to try things I haven't tried before. i wanted to do CSA this year but me and B cannot eat a full share by ourselves. how do you and Cory do it? or does your farm offer half shares? They offer 3/4 shares, that they say is good for 2 people. I'm still worried that we won't get through all of it, but mostly because things like pea tops wilt quickly.